Halo, Starkey’s newest Made for iPhone® hearing aids help you stay connected to the people and things you love most. 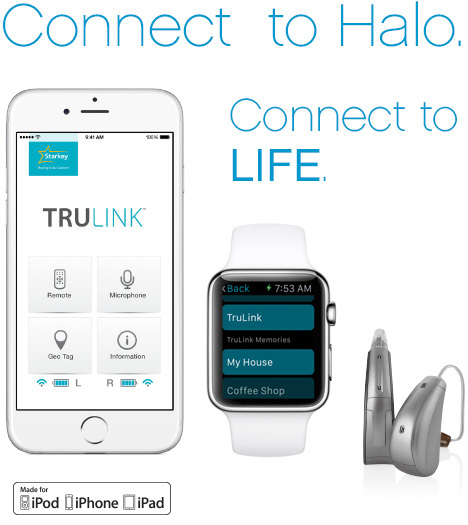 With our easy-to-use TruLink™ Hearing Control app, Halo is engineered to work specifically with your iPhone, iPad®, iPod touch® and Apple Watch®. And with new processing power in Halo, you’ll experience music in a whole new way with pure, refined sound quality. A MORE NATURAL LISTENING EXPERIENCE: Starkey’s Binaural Spatial Mapping delivers maximum listening comfort for louder sounds while providing a more natural, overall sound.Voice iQ™² is a noise management and speech preservation system intended to let patients hear effectively in noise. SUPERIOR AUDIBILITY IN NOISY ENVIRONMENTS: Thanks to Acuity Directionality™, our new multichannel adaptive directionality solution, speech protection is improved in difficult listening situations. Starkey’s proprietary Speech ID detects speech even when it occurs behind the patient. The combination of these two innovative technologies results in consistent, high-fidelity sound that helps patients listen to speech and participate in conversations in even the noisiest environments. The system’s Micro-Electronic Mechanical Systems (MEMs) microphones are the same as found in today’s iPhone. DISTORTION-FREE COMFORT IN LOUD SITUATIONS: Our ISO-Clear Compression delivers a more personalized listening experience by making soft speech sounds audible without affecting louder inputs. Loud sounds are discreetly managed while maintaining the quality of lower-level sounds. SAY FAREWELL TO FEEDBACK: Starkey’s best-in-class feedback cancellation system, PureWave Feedback Eliminator has the ability to manipulate how aggressively it performs, so feedback elimination can be personalized to the specific product and patient. It’s designed to identify, classify and eliminate annoying whistling and buzzing in all environments, so your patients experience feedback-free listening. LAUGHS AT WATER AND WAX: Halo features Starkey’s proprietary moisture protection, HydraShield®2. When combined with Halos’ unibody construction, this nano-coating delivers excellent protection from water, wax and oils. JOIN THE CROWD WITH ACTIVE NOISE REDUCTION: Comfort Boost allows patients to aggressively reduce noise on-demand while optimizing sound quality in environments like noisy restaurants or crowded rooms. functional settings — we want to enjoy listening in every setting. and participate in conversations from all directions. immersive and impressive listening experience. control and adjust their hearing aids more easily than ever. 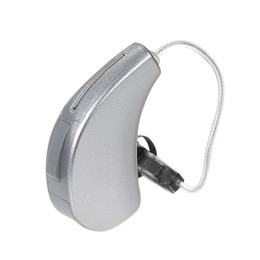 Try the latest in Starkey hearing technology from a local hearing healthcare provider.